Since 2016, IHIF and the Scottish Life Sciences Association (SLA) have partnered to bring our member companies and life science communities closer together. This year, we are pleased to welcome a delegation of SLA members to Indiana and offer this chance for our Hoosier friends and members to learn more about our special relationship! Scotland has one of the largest Life Sciences clusters in Europe, employing over 37,000 people across some 700 organizations. Scotland is home to a range of multinationals and small and medium enterprises (SMEs) with a strong track record of creating and growing start-ups. A thriving entrepreneurial culture in the universities creates more spin-outs than any other region of the UK. Key subsectors include: pharmaceutical services, medical technologies, regenerative and precision medicine, digital health and industrial biotechnology. Please join us on Monday, May 6th from 3:30 – 6:30 pm, for a “Doing Business in Scotland Briefing”, followed by a networking reception with SLA members as our special guests! 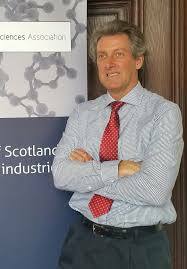 Scott has been CEO of the Scottish Lifesciences Association since 2011. He started his career with a large pharmaceutical company where he gained technology transfer and R&D experience with a broad range of companies including Fisons (UK), Kevex based in California and Applied Research Laboratories based in Switzerland. From 1998 to April 2004 he was co-founder and MD of YAbA Ltd and secured venture capital to develop and manufacture human and veterinary diagnostic products. He was a member of the Scottish Government’s Life Sciences Advisory Board where he chaired its Technology Workstream from 2009-2011. Scott is a Director of Benenox Ltd and Marine Biotech Ltd.
Scott is a Chartered Engineer and holds an Honours Degree in Engineering from Edinburgh Napier University and a MBA from Edinburgh University. He is a Fellow of the Institute of Engineering and Technology and a Fellow of the Institute of Mechanical Engineers. He is a former Scientific Member and Vice-Chair of Medical Research Scotland and current advisory board member with Promedim Ltd. Scott also forms the Health Innovation Partnership Industry Liaison Team in partnership with the Scottish Government. He is a member of the Advisory Board of the Scottish LifeSciences Association.